Risen 3 is a rare entity, a rough diamond in the truest sense. An adventure that sets its stall somewhere between the piratey high-seas of Assassin’s Creed: IV: Black Flag and the free-roam, diplomacy or action role-playing of the Fallout games, Piranha Bytes’ tale is one of pronounced peaks and troughs. On a technical level, it’s an absolute calamity, but if you’ve the resolve to look beyond its myriad quibbles, there’s a rich, sizable and rewarding nautical journey to busy yourself with. Like with Shadow Man though, if you can look past its admittedly-considerable running issues, there’s an awful lot to enjoy. It’s open-world in the true sense. Risen 3 doesn’t just use scenery to fill space (though there is plenty of that, of course); it’s half-a-dozen or so islands are a treasure hunter’s dream, positively crammed with as much looting, scavenging and brawling as you could ever reasonably expect to find in a video game. Even seemingly innocuous caves and cubbyholes may house clues to legendary treasures, mythical beasts or one of a seemingly endless strand of hints or clues that set you on your way on another quest. This is Risen 3 at its best; you’re never left short of avenues to pursue, and it recognises the joy of chasing up a little morsel, no matter how small, if there’s a prospect of something special at the end of it. Progression appears fractionally better structured than its predecessor, and ever so slightly more rewarding. Once again, there’s a ‘point of no return’ moment where you’re asked to join a faction; three different sects all of whom bestow upon your character a slightly different means of magic, as well as their own relatively comprehensive list of quests to tackle a little past the halfway point. The character development system remains unchanged; that’s one area where Risen has been completely sound. It affords the freedom to develop a number of attributes that cover combat, magic, cunning, influence and pickpocketing skills, among others. Like Fallout, but with slightly less focus on the consequence of small interactions, Risen 3 rewards different approaches to tackling errands. Thanks to the oft-amusing dialogues, the markedly varied means by which you can develop your pirate, and the dubious benefits of intimidating characters for extra goodies, you’ll find there’s decent incentive to experience the satisfaction of a ‘good’ playthrough and the unrestrained glee of a ‘bad guy’ run. Combat is hindered by sluggish controls, but there’s a solid range of bounty hunting missions and intimidating foes to face. Though it’s a bit strange that an enemy set diverse enough to encompass giant rats, forest spiders, wild boars and ghouls can somehow result in them all sharing similar attack moves, the fight system does at least demand what many other modern adventures are tending to bypass; the need to guard and evade. Each encounter requires an element of timing and skill. It’s a small point, but one that’s beneficial to the game as a whole, as it means the player remains engaged for longer periods, and doesn’t simply switch off when a fight breaks out. 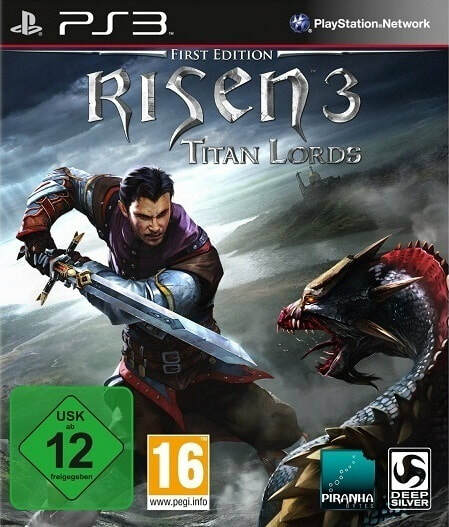 Risen 3: Titan Lords’ strongest suit is in the excellent value it represents in terms of content. Whilst it’s now a sad inevitability that chunks are left off for further exploitation as DLC, few could begrudge the helping R3 presents, with well over one hundred quests to tackle and thirty to forty hours of play in here, easily. With fewer technical issues, it could well have been a top game, and there’s no question, the sheer amount of baggage will likely taint the experience for many experiencing it on PlayStation 3. All things considered though, it’s a very moreish sea quest. Whilst it’s every bit as technically backwards as its predecessor, on measure, Risen 3 is a bit better overall. It just goes to show, looks aren’t everything.